NICOSIA, Cyprus Cypriot government officials sought Tuesday to alleviate the pain on small savers from a plan to raid bank deposits that has caused outrage in the country and sent jitters through European financial markets. Just hours ahead of an expected vote in the country's 56-member Parliament on the seizure of a percentage of deposits, officials sought to limit the impact on small savers. They even hinted that the country was looking to limit the amount it is to raise from the measure's imposition -- a move that could cover any shortfall from freeing smaller deposits from the charge. A new draft bill discussed in Parliament's finance committee proposed to spare all deposits below 20,000 euro ($25,900) from a levy. Those between 20,000 euro and 100,000 euro ($129,290) would still have a 6.75 percent charge imposed, and those above 100,000 euro would be hit for 9.9 percent, in line with the original plan put forward at the weekend. A vote in favor of the bank account confiscation is needed if Cyprus is to get 10 billion euro in rescue loans from its euro partners and the International Monetary Fund. The seizure of deposits is meant to raise 5.8 billion euro, which is part of the country's rescue. If the vote fails to get through Parliament, Cyprus faces potential bankruptcy and a possible from the euro, which could reignite concerns in financial markets over the future of the single currency. Although Cyprus is the smallest eurozone country to be bailed out, the details of the plan sent shockwaves through the single currency area as it was the first time European authorities have targeted people's bank accounts. Other bailed out countries such as Greece, Ireland and Portugal have raised funds through imposing new taxes. Proponents of the Cypriot account levy argue that this way gets foreigners who have taken advantage of Cyprus's low-tax regime to share the cost of the bailout of the country's banks, which have been hit hard by their over-exposure to bad Greek debt. About a third of all deposits in Cypriot banks are believed to be held by Russians. As lawmakers wrangled, Finance Minister Michalis Sarris was to fly to Moscow Tuesday afternoon to meet with his Russian counterpart. Opponents point out that a blanket charge on people's bank accounts will hurt ordinary Cypriots more, and could shake the confidence of all in the country's banking sector. And by going after deposits, European policymakers have set a precedent that could be repeated in the future. The worry of bank runs across Europe lies at the heart of the concerns in markets at the moment. In a sign of the scale of disagreement over the deposit charge, the country's central bank governor, Panicos Demetriades, recommended that no accounts below 100,000 euro be touched. That level represents the amount of savings that are supposed to be insured if a bank collapses. 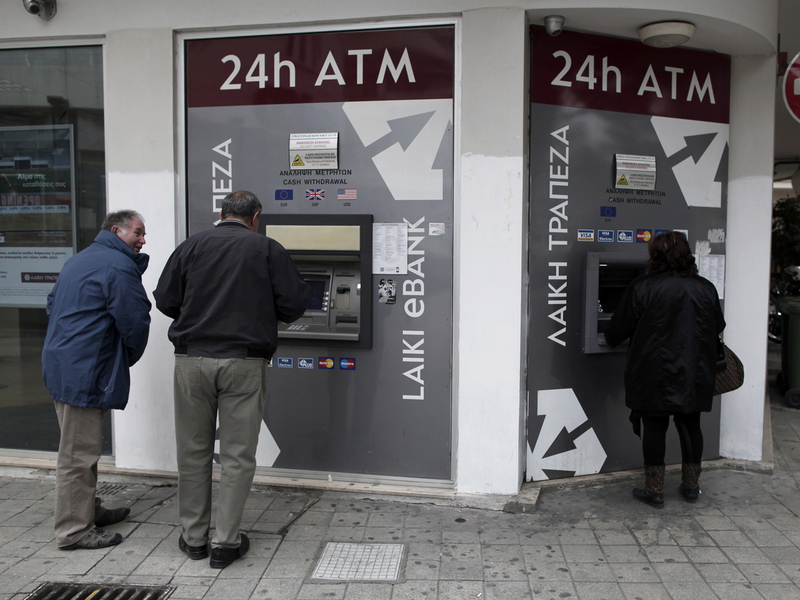 "We believe that deposits up to 100,000 euro should not be levied," said Demetriades. "The credibility of and trust in the banking sector depends on this." Banks have been shut until Thursday to prevent a bank run. Demetriades said he expects at least 10 percent of deposits to be withdrawn when the banks re-open. "We expect outflows, but the European Central Bank has assured us that it will provide adequate liquidity to the banks because it will consider them viable," he said. Eurozone finance ministers held a telephone conference Monday night, and concluded that small depositors should not be hit as hard as others. They said the Cypriot authorities should stagger the deposit seizures more, but insisted that the overall take should stay the same. The new Cypriot proposal, if approved, would raise less funds than the 5.8 billion euro demanded. It was unclear how the shortfall might be made up. However, Cyprus President Nicos Anastasiades told German Chancellor Angela Merkel in a telephone conversation Monday night that "the possibility of reducing the requirements from self-raised funds is being explored," government spokesman Christos Stylianides said Tuesday. The two leaders were expected to speak again on Tuesday, Stylianides said. Cyprus's central bank governor noted that the ECB "believes we have to try to protect guaranteed deposits." Demetriades stressed the importance of the bill being voted on and passing in Parliament. "It's important for the future of the banking sector and the economy that this bill is passed," he said in the committee meeting, adding that "we believe that once trust is restored, deposits will return." Christine Lagarde, the head of the International Monetary Fund which is participating in Cyprus's bailout, said in Frankfurt that the IMF was "extremely supportive of the Cypriot authorities' intentions to introduce more progressive rates in the one-off tax."